PHOENIX contains nothing but natural, safe substances that are 100% scientifically proven to aid in fat loss. The research is crystal clear: when combined with a proper diet and exercise routine, PHOENIX will help you lose fat faster. While our choice of ingredients alone sets PHOENIX apart from the rest of the crowd, what really proves its superiority is that each ingredient is included at clinically effective dosages. 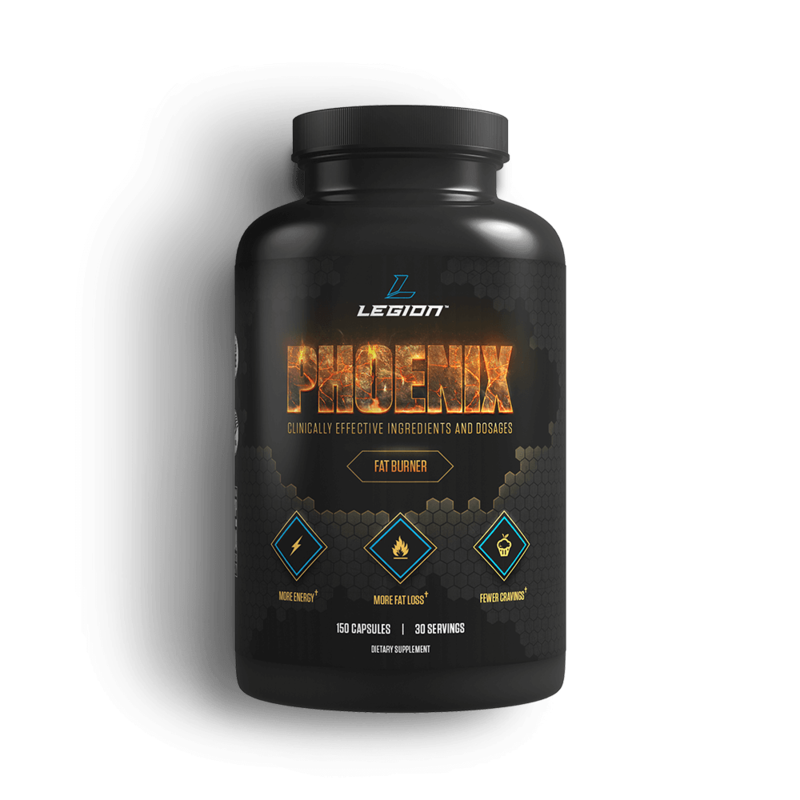 That means that the dosages of each ingredient in PHOENIX are based on published scientific research proving fat loss benefits, not the restrictions of razor-thin production budgets or gluttonous profit margins. When you start comparing actual numbers, you can quickly see that one serving of PHOENIX contains about two to three times the effective ingredients of our best competitors' products. Compare the PHOENIX formulation to any other fat loss product on the market, and it's easy to see how inferior our competition really is. If you want to lose fat faster and experience the type of fat-burning power that only clinically effective dosages of scientifically validated ingredients can deliver…and if you want to do it without p.umping yourself full of stimulants or other potentially harmful chemicals…then you want to try PHOENIX today. While there are notable exceptions, the majority of fat burners on the market contain little more than a handful of cheap stimulants to make you feel like you're burning fat and a smattering of underdosed, unproven, or ineffective (and often all three!) ingredients thrown in to pad the ingredients list and make you think you're getting a lot for your money. So, before we look at PHOENIX's formulation, let's quickly review the physiology of fat loss and how it can be enhanced through supplementation. Your metabolic rate is a "count" of how much energy your body burns throughout the day, and the higher it goes, the faster you can lose weight. This is because when you boil fat loss down to its utmost simplicity, it's determined by the difference between the energy your body burns and the energy you feed it with food. Expend more energy than you consume over time, and you'll lose fat. Reduce efficiency of the process through which cellular energy is produced, thus increasing the "energy cost" of meeting the body's needs. There are many ways to manipulate those mechanisms, and as you'll see, PHOENIX focuses on the most effective methods. A major reason diets fail is people just aren't able to stick to them long enough. Wishes turn into cravings and ultimately binges, which can undo days or even weeks of hard work if it really gets out of hand. While some people have an easier time than others, almost everyone has to deal with hunger and cravings to one degree or another. It's just human nature to want to indulge in food after accidental or intentional deprivation, and regardless of whether it's normal, it's still interfering with your goals. Many compounds are known to reduce hunger, and others are known to increase the sensation of fullness you get from a meal. When a combination of proven molecules is used effectively, you can successfully reduce hunger and cravings and derive the maximum benefits from your diet. Make no mistake: while recreating your body with diet, exercise, and supplementation can dramatically change your life for the better, it's not easy. No amount of pills or powders is going to get you there. It takes hard work, and it takes time. And this is another major reason why diets fail: people don't want to go through the discomfort of it all. Although the physiological machinery involved in fat loss is vast and complex, the practical application remains simple. Contrary to what many other companies would lead you to believe, directly stimulating any of the thousands of proteins and enzymes involved in fat loss either doesn't work or is uninvestigated. Fat loss is a whole-body process, and by focusing on simple, key, and proven targets, everything else activates and functions accordingly. PHOENIX's formulation is the result of an extensive scientific review of a wide variety of natural molecules known to favorably affect fat loss, and we carefully chose a handful that work synergistically to safely deliver consistent results on all three points described above. Synephrine is a chemical compound found in certain types of citrus fruits (particularly the bitter variety). It's chemically similar to ephedrine and catecholamines (the chemicals adrenaline and noradrenaline, which cause the breakdown of fat cells), and although less potent than those two, it induces similar effects. Increases the thermic effect of food, which is the "energy cost" of metabolizing food. Furthermore, research shows that synephrine works synergistically with caffeine to enhance both caffeine's and its own fat loss properties. The synergism noted in a standard "ECA" (ephedrine, caffeine, and aspirin) stack also applies to synephrine. Clinically effective dosages of synephrine range from 25 to 50 mg.
Research shows that naringin stimulates the production of a hormone called adiponectin, which is involved in the breakdown of fat cells, and that it activates a type of receptor in fat cells that regulates fat mobilization (the PPARα receptor). Research also shows that through these mechanisms, naringin works synergistically with synephrine and hesperidin to further accelerate the basal metabolic rate. The clinically effective dosage of naringin, when used in conjunction with synephrine and hesperidin, is 600 mg. The clinically effective dosage of hesperidin, when used in conjunction with synephrine and naringin, is 100 mg. Think about that number for a moment. That's the same amount of calories burned in about 20 minutes of jogging. That's an additional 1,300 calories burned every seven days–a little more than one-third of the calories in a pound of fat. That matters. 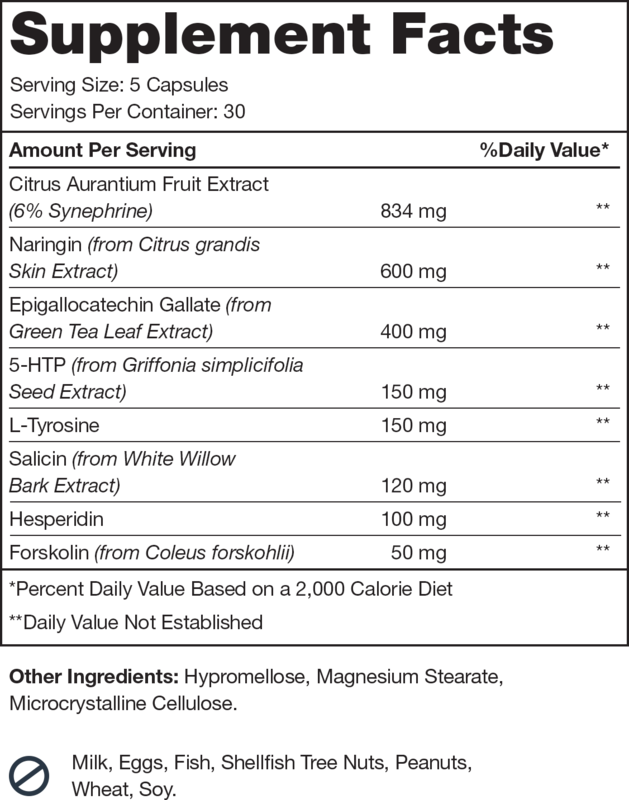 Well, PHOENIX takes this synephrine "stack" even further by including three more ingredients that amplify its metabolic effects: hordenine, EGCG, and salicin. Epigallocatechin gallate (also known as EGCG) is a form of a molecule known as a catechin and is found in green tea, certain types of nuts, and carob. While green tea catechins refer to up to six catechin molecules, EGCG is the one implicated in fat-burning effects to the largest degree. Clinically effective dosages of EGCG are highly variable, between 50 and 1,000 mg.
We settled on 400 mg of EGCG per serving because this is the lowest dose known to reliably have fat-burning properties. Higher doses were not included due to diminishing returns seen with fat loss, and in some people, high doses cause hyperstimulation and nausea. cAMP and ATP—adenosine triphosphate, the most basic form of cellular energy in the body—interact in a very simple yet powerful way in the cell. When ATP is high it indicates a plentiful energy state and the body will aim to store and build tissue, but when cAMP is high it signifies a lack of ATP and thus initiates a process to make more ATP by burning through energy reserves. While a clinically effective range is not known and is likely vast, 25 to 50 mg forskolin is known to be effective. 5-HTP is a compound involved in the metabolism of the amino acid tryptophan, which is found in foods like milk, meat, potatoes, pumpkin, and various greens. It's converted into serotonin in the brain, which is one of the principal neurotransmitters involved in feelings of happiness. 5-HTP is used over L-tryptophan as it can cross the blood-brain barrier (whereas L-tryptophan can't), and used preferentially over serotonin itself due to a greater safety profile with oral administration. Hordenine is a molecule produced naturally in the body. It is found in certain foods including barley, millet, and sorghum, and some types of cacti. Research shows that hordenine inhibits the activity of the enzyme monoamine oxidase, which breaks down certain neurotransmitters, including adrenaline, which induces lipolysis. This, in turn, allows this chemical to remain in your blood for longer periods, mobilizing more fat cells. Hordenine isn't used clinically, but the nonclinical effective dosages range from 25 to 75 mg.
We chose the low end of effective dosages to preserve efficacy while avoiding safety concerns associated with hordenine when high doses are used in conjunction with other components of PHOENIX. Clinically effective dosages of salicin range from 100 to 200 mg. The reason we've included L-tyrosine is because longer-term usage of 5-HTP may deplete bodily tyrosine stores. While most people using this product wouldn't use PHOENIX long enough to cause a deficiency and will get plenty of tyrosine from their diets, we've included it as a "just in case" safety buffer. While PHOENIX is a potent fat burner by itself, it was built to work synergistically with caffeine. So if caffeine makes this formulation even more effective, why doesn't it contain any? Well, we surveyed thousands of our customers and followers and found that most people prefer to get their caffeine from other sources, such as coffee or pre-workout drinks or both. Ideally, they said, they could stack our fat burner with caffeine-containing products without dramatically increasing caffeine intake. So that's what we created: the first fat burner that is not only effective on its own, but it is also one that you can take with your morning coffee, not instead of it. Furthermore, PHOENIX's formulation allows you to stack it with our pre-workout supplement PULSE, which will help you lose more fat while maintaining workout performance and intensity. If you want to lose fat faster and experience the type of fat-burning power that only clinically effective dosages of scientifically validated ingredients can deliver…and if you want to do it without pumping yourself full of stimulants or other potentially harmful chemicals…then you want to try PHOENIX today. 01. Citrus aurantium and synephrine alkaloids in the treatment of overweight and obesity: an update. 02. Activities of octopamine and synephrine stereoisomers on alpha-adrenoceptors. 04. Effect of acute administration of an herbal preparation on blood pressure and heart rate in humans. 05. Naringin and hesperetin, two flavonoids derived from citrus aurantium up-regulate transcription of adiponectin. 06. Effects of p-synephrine alone and in combination with selected bioflavonoids on resting metabolism, blood pressure, heart rate and self-reported mood changes. 07. Citrus polyphenol hesperidin stimulates production of nitric oxide in endothelial cells while improving endothelial function and reducinginflammatory markers in patients with metabolic syndrome. 08. Molecular modelling study of the mechanism of high-potency inhibition of human catechol-o-methyltransferase by (-)-epigallocatechin-3-o-gallate. 09. Green tea catechin consumption enhances exercise-induced abdominal fat loss in overweight and obese adults. 10. Green tea polyphenols: novel irreversible inhibitors of dopa decarboxylase. 11. Multiple pathway signal transduction by the cAMP-dependent protein kinase. 12. Forskolin as an activator of cyclic AMP accumulation and lipolysis in rat adipocytes. 13. Body composition and hormonal adaptations associated with forskolin consumption in overweight and obese men. 14. Clinical efficacy of Coleus forskohlii (Willd.) Briq. (Makandi) in hypertension of geriatric population. 15. The effects of oral 5-hydroxytryptophan administration on feeding behavior in obese adult female subjects. 16. Brain serotonin, carbohydrate-craving, obesity and depression. 17. Selective inhibitors of monoamine oxidase type b and the "cheese effect". 18. Selective inhibitors of monoamine oxidase type b and the "cheese effect". 19. Pharmacokinetics of salicin after oral administration of a standardised willow bark extract. 20. Ephedrine, xanthines and prostaglandin-inhibitors: actions and interactions in the stimulation of thermogenesis. 21. Aspirin as a promoter of ephedrine-induced thermogenesis: potential use in the treatment of obesity. Take 3 capsules with your first meal of the day, followed by 2 capsules with a later meal. To maximize effectiveness, combine with caffeine. Not intended for use by persons under age 18. Do not exceed recommended dose. Do not consume synephrine from other sources while taking PHOENIX. Consult your physician prior to use if you are pregnant or nursing, or if you are taking medication, including but not limited to MAOIs, SSRIs, or other antidepressants or antipsychotics. Individuals with a known medical condition should consult a healthcare professional before using any dietary supplement. Exert caution when using PHOENIX alongside other stimulatory and neurologically acting dietary supplements. How quickly will I see results with PHOENIX? With one serving of PHOENIX per day, you can expect your body to burn an additional 150 to 200 calories and to benefit from several other mechanisms that accelerate fat loss. We’ve found that if you know what you’re doing with your diet and exercise, and if you take PHOENIX every day, you can expect to lose, on average, an additional 0.5 pounds of fat per week. With proper diet and training, most people can expect to lose about 1 pound of fat per week, so as you can see, this is quite significant and really starts to add up as the weeks go by. Even if PHOENIX helps me lose weight, will I just gain it back when I stop taking it? The only way you can regain the fat PHOENIX helps you lose is by dramatically overeating once you’re done dieting, which is a common mistake many people make. Will PHOENIX damage my metabolism? When you take PHOENIX, your metabolism will temporarily run faster. When you stop taking it, it will return to normal. The only way you could “damage” your metabolism, with or without PHOENIX, would be starving yourself for many months, and even then, research shows that the long-term effects are slight. Will PHOENIX make me lose muscle? The only way you can lose a significant amount of muscle while taking PHOENIX is to do things that would cause muscle loss whether you took it or not. Those things include common mistakes like eating too little food (too few calories), eating too little protein, and exercising too much (especially doing too much cardio). If you know what you’re doing with your diet and training, however, you can lose fat rapidly without losing any muscle to speak of, and PHOENIX can help you do it faster. You’ll know PHOENIX is a real product by the results. Many of our customers are fitness competitors that meticulously track everything while preparing for competitions, and we’ve heard from them time and time again about the benefits of PHOENIX. Specifically, a noticeable reduction in hunger and cravings and increased fat loss over their normal rate by anywhere from 30 to 50%. PHOENIX only has 9 ingredients. Other fat burners have 15, 20, and some even more. What gives? So, in the case of PHOENIX, each ingredient was carefully chosen based on scientific proof of safety and effectiveness, which naturally limited our choices. The result is a fat burner unlike any other on the market, with every ingredient backed by good scientific research and included at clinically effective levels. In terms of PHOENIX, when you compare it to other fat burners, it looks like it has “super-doses” of various ingredients like synephrine and forskolin. These dosages aren’t inordinately high, though. These are the amounts required to noticeably accelerate fat loss. No jitters, nausea, or discomfort of any kind. That said, some people find that PHOENIX upsets their stomach when they first start taking it. This usually goes away after the first week or so, but taking it with meals containing a fair amount of soluble fiber is an immediate remedy. Should I take PHOENIX every day? The more frequently you take PHOENIX, the more it can help you lose fat faster. Should I take more than one serving of PHOENIX per day? We should note, though, that high amounts of EGCG intake isn’t advised for people with preexisting liver issues. Can I take PHOENIX before bed? We wouldn’t recommend it because synephrine is a light stimulant and may interrupt your sleep. Should I take PHOENIX if I’m bulking? The purpose of bulking is to keep yourself in a slight calorie surplus, so taking PHOENIX will only mean you’ll have to eat slightly more food every day. And while an argument could be made that PHOENIX will help with reducing fat gain while bulking, we’d say save your money and just use it when you’re cutting. PHOENIX is kind of expensive. Why should I buy it over cheaper alternatives? How long can I safely use PHOENIX for? That said, it’s smart to “cycle” on and off to maintain sensitivity to the ingredients, and especially the synephrine, hesperidin, and naringin. Specifically, we recommend you take PHOENIX for 4 weeks, then take a week off, and then resume taking it again. Do I HAVE to take PHOENIX with food? In terms of fat loss, PHOENIX is effective when taken with and without food. If you train fasted and take PHOENIX with caffeine before you work out, you will burn more fat in that workout. That said,the green tea extract may make you nauseous. If you take it with food, this won’t happen. Another benefit of taking PHOENIX with food is the increased fullness from the 5-HTP, which must be taken with a meal to produce these effects. The L-tyrosine in PHOENIX comes from animal sources.